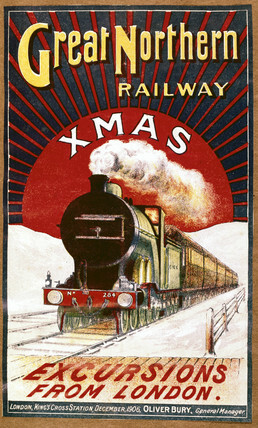 Advertising brochure for the Great Northern Railway, promoting Christmas excursions from Kings Cros Station, London. The Great Northern Railway's (GNR) main route from London to Doncaster was completed in 1852, the same year that the railway's London terminus opened at Kings Cros. The railway operated services to many of the major towns in the north of England.